Attached for your information is a copy of an interpretation made for the State of Kentucky regarding the indication of carcinogenicity on material safety data sheets. Please inform all State and Area Offices in your Region of this interpretation. This is in response to your letter dated April 29 to Mr. Charlie Anderson of our Atlanta Regional Office regarding the Hazard Communication Standard (HCS). First, it appears from reading your letter to Mr. Anderson that you may be under the misconception that an OSHA 174 is a required form. 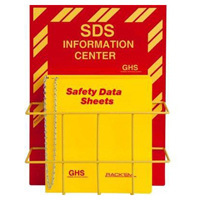 It is not a required form, nor is any material safety data sheet format required by the HCS. Secondly, the standard specifies the minimum amount of information that is required on the material safety data sheet, such as physical and chemical characteristics. This type of information must always appear on the material safety data sheet. However, with carcinogens the standard requires that the material safety data sheet must state "whether" a chemical is a carcinogen, and not "whether or not" it is a carcinogen. Only when the condition is affirmative must this indication appear. A section for carcinogenicity would not even have to appear on a material safety data sheet if a chemical was not a carcinogen. However, if a space for carcinogenicity does appear on the material safety data sheet being used, then that area has to be addressed and no blank spaces are permitted; see 29 CFR 1910.1200(g)(3). If a chemical is not a carcinogen then phrases such as "no information found" or "not applicable" would have to be used in the space provided for carcinogenicity. Concerning your question regarding compressed air, it is applicable under the standard's definitions for compressed gas and physical hazards. If you have any further questions, please feel free to contact our office. Forwarded for your response is a letter dated April 29, 1986, from Guy Schoolfield requesting interpretations of two items in the Hazard Communication Standard, 29 CFR 1910.1200. The first is in regard to whether a notation must be made on a Material Safety Data Sheet (MSDS) as to whether a substance is carcinogenic or not (reference 1910.1200(g)(2)(vii) and (g)(3)). The second question is in regard to whether compressed air is within the scope of the standard. We are transmitting the letter as the above issues are not officially addressed in the directive, CPL 2-2.38. Please send us a copy of your response to Mr. Schoolfield. Suite 587, 1375 Peachtree Street, N. E.
Please accept this correspondence as formally requesting interpretations on two subjects relating to 29 CFR 1910.1200, Hazard Communication Standard. I have asked Mr. Roger Alcorn, Industrial Hygienist, Kentucky OSHA Area Office, to determine if: (1) Material Safety Data Sheets require a "yes" or "no" if the substance is carcinogenic? (2) Is compressed air within the scope of the Standard? Mr. Alcorn discussed these issues with Mr. Solomon Raines of your office. In turn, Mr. Raines evidently talked with Mr. Steven Simmons of the National Office about these two issues. We were advised a "no" is not required to be listed on the Material Safety Data Sheet. However, it appears to us that the new OSHA form 174 (September, 1985) requires "no" to be listed, if applicable, because this is not marked "optional", as Section II allows. Also, there are question marks behind NTP, IARC Monographs and OSHA Regulations, in Section VI. Furthermore, 1910.1200(g)(2)(vii) and 1910.1200(g)(3) seem to require that a "yes" or "no" be indicated on the MSDS. Concerning compressed air, we were advised that our assumption was correct that 1910.1200(c) (definitions) regulates compressed air as being under the standard. We respectfully request written interpretations on these two issues. We are conducting in-house training on this standard on May 12, and would very much appreciate receiving this information prior to our training.